It says something about the shocking lack of transparency in NAMA that to date the agency has confirmed the details of one sale, and one sale only – the Montevetro transaction earlier this year when Google paid €99.9m for a landmark new central Dublin office building from Treasury Holdings. 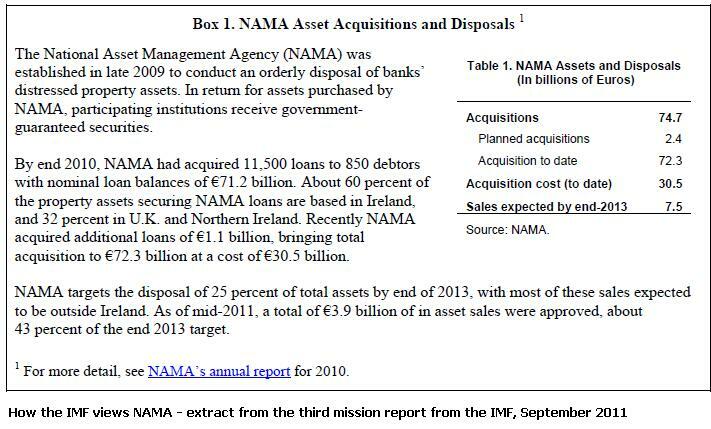 And yet to date, as revealed in the IMF report on Ireland published today, NAMA claims to have approved €3.9bn of disposals. So with respect to the details of 97.5% of the disposals, there has been no word whatsoever from NAMA. Some transparency, huh? Of course there is a considerable difference between approval and sale – deals fall through, anticipated funding doesn’t become available, circumstances change, buyers plump for competing properties. We just don’t know how solid the €3.9bn is. What we do know is that in the 2010 accounts, NAMA booked a total of €363m of sales and in the Q1, 2011 accounts an additional maximum of €254m. So it would seem that the majority of the approvals hasn’t yet materialised into bookable sales. It seems quite lax of the IMF not to have concluded something more concrete about NAMA’s progress, almost as lax as the IMF miscalculating in the box above €3.9bn as a proportion of €7.5bn and coming up with 43%, rather than 52%. There is an attempt to track NAMA’s sales on here but absent any detailed reporting from the agency, it seems likely that many sales are going unreported. For example, Northern Ireland property group Beltrae Partners claims to have “originated and advised” on two major NAMA transactions totalling over €100m – the sale of an English nursing home portfolio and London student accommodation – neither of which has been reported. NAMA gave itself a target of paying down 25% of its debt by the end of 2013 in its business plan published in June 2010. There seems to be some suggestion that this target made it into the IMF memorandum of understanding, thereby copper-fastening it as a commitment, but I cannot see this as a term of the agreement with our bailout friends which presumably means that the target can be amended by NAMA without seeking permission from the IMF or indeed the Government. Remember when NAMA was a glint in economist Peter Bacon’s eye? Way back when the Department of Finance was, according to Wikileaks, hinting that the haircut on loans would be closer to 50%? And when one of the greatest concerns was that this colossal new agency, the biggest quango in Irish history, would fall prey to cronyism and the sort of skulduggery that has long been a feature of public life in this country? This concern was going to be countered by strict NAMA anti-lobbying legislation that could land you in prison if you set out to corrupt NAMA’s purpose. And so it came to pass that section 221 of the NAMA Act tried to put pay to the gombeenism that has characterised Irish life for decades if not centuries. Since the passing of the NAMA Act into law, we have witnessed the pain endured by former minister Willie O’Dea over his dilemma whether or not he could approach NAMA with health, safety and anti-social concerns about a NAMA site in Limerick, and former tourism minister Mary Harney who was at pains to emphasise her talks with NAMA were in no way to be construed as lobbying even when it was plain that the minister was urging NAMA to act to counter concerns in the hotel sector that it was being undermined by the agency’s handling of hotel-related loans. The Department of Education seemed less unsure about its position and contacted NAMA to see if it could acquire NAMA property to be used for, or converted into, schools. And it seems to me that some politicians in Northern Ireland, most notably finance minister at the Assembly, Sammy Wilson were blatant in their approaches to NAMA urging the agency to avoid fire sales and invest in development in the North. Limerick City Council recently urged NAMA to get a move-on with the development of the Opera shopping centre. The NAMA CEO has said that the agency meets with up 50 investors per week who are potentially interested in acquiring assets from the agency. I have never really understood how NAMA’s anti-lobbying rules could have succeeded in stopping anyone lobbying NAMA because the exemptions in the legislation were so wide as to exclude practically any lobbying from its ambit. The independent TD for Wicklow and east Carlow, Stephen Donnelly wrote to NAMA in August 2011 (copy of his letter here) urging NAMA to “to prioritise making a decision on Sispar’s February proposal so that, should NAMA endorse it, the people of Greystones will be able to avail of improved facilities at their Harbour”. Sispar is the developer ofGreystonesHarbour in Wicklow and its loan to develop the site is apparently in NAMA. Deputy Donnelly concludes his letter with “I am making this representation in my capacity as an elected representative for the area, and in the public interest. I will make this representation available to the community on my website, http://www.stephendonnelly.ie, in accordance with the National Asset Management Agency Act 2009.” So he too is being cognizant of the NAMA anti-lobbying rules – specifically section 221(3) – and his letter doesn’t reveal anything other than a wish to improve the lot of his constituents and one of the amenities on his patch. Deputy Donnelly has now apparently received a reply from NAMA saying that Sispar’s plan for the Harbour redevelopment will be responded to by the end of September 2011. And Deputy Donnelly has apparently wrung a concession from NAMA, that the agency will consider the public value of the development as well as its commercial prospects – in other words, NAMA might fund the redevelopment even if it doesn’t make financial sense to do so. So what is to stop a NAMA developer asking their local TD to intervene with NAMA, in much the same way that a constituent might ask their TD to intervene in the granting of medical cards or other social welfare? According to s221(4) of the NAMA Act it is not an offence if, for example, a politician contacts NAMA in the course of their employment and does so in that capacity. And sure isn’t it part-and-parcel of a TD’s job to represent their individual constituents? Have we at last arrived at a position where the original concern of shenanigans lies unaddressed because NAMA’s anti-lobbying rules are so badly drafted with such wide exemptions?